The world's largest active geyser has erupted three times in the past six weeks at Yellowstone National Park, including once this week, in a pattern that is unusual but not at all indicative of a more destructive volcanic eruption brewing beneath Wyoming, geologists said on Saturday. Steamboat Geyser, which can shoot water as high as 300 feet (91 meters) into the air, erupted on March 15, April 19 and on Friday. The last time it erupted three times in a year was in 2003, the U.S. Geological Survey's Yellowstone Volcano Observatory said. Yellowstone sits atop a volcano that created a vast crater. Its plateau hosts the world's most diverse and expansive continental hydrothermal systems, including the multicoloured springs, mud pots and geysers for which the park is known. Steamboat Geyser in Yellowstone National Park sure has been active lately - 3 water eruption in 6 weeks (March 15, April 19, and April 27)! 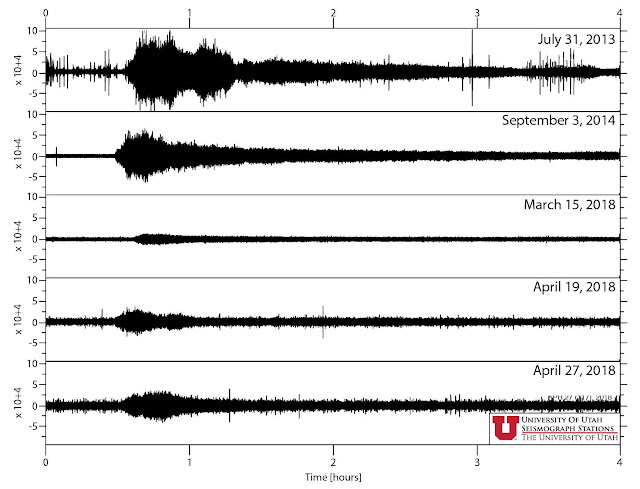 University of Utah Seismograph Stations seismic and U.S. Geological Survey (USGS) water gage data (Tantalus Weir) indicate that a water eruption of Steamboat began today around 6:30 a.m. Mountain Time. That’s only 7 days since it last erupted on April 19. After the March 15 water eruption (first since 2014), National Park staff installed a temporary temperature logger, which recorded a spike of around 60 degrees Celsius for the April 19 eruption. Temperature data haven’t yet been downloaded for the water eruption today. There were eyewitness reports of a vigorous steam phase a couple hours after today's water eruption phase began. When comparing the seismic amplitudes for the March and April water eruptions, we note that the April events were a little stronger than the one in March. However, the seismic signals from these three were all much smaller than major water eruptions in 2013 and 2014. We will be sharing more information about this interesting recent activity at Steamboat in this Monday’s edition of Yellowstone Caldera Chronicles -- look for it on social media and the YVO website homepage!